Our Operations VHF Frequency is planned to change on Monday 17th December 2018 as part of the 8.33 MHz transition. Please update your records. Delete 131.750 and update to 131.755. Callsign for Ravenair Fleet = RAVENOPS LIVERPOOL Callsign for LAS FBO JetCentre Handling = LAS Liverpool. Over and Out! Just to remind everyone that discontinuous strike action at Liverpool John Lennon Airport continues with action on Monday 03rd September from 07:00hrs to 19:00hrs. Once again, full contingency is in place and the Airport is expected to operate as normal throughout this 12 hour period. If anyone has any questions, please give your usual Airport point of contact or myself a call. 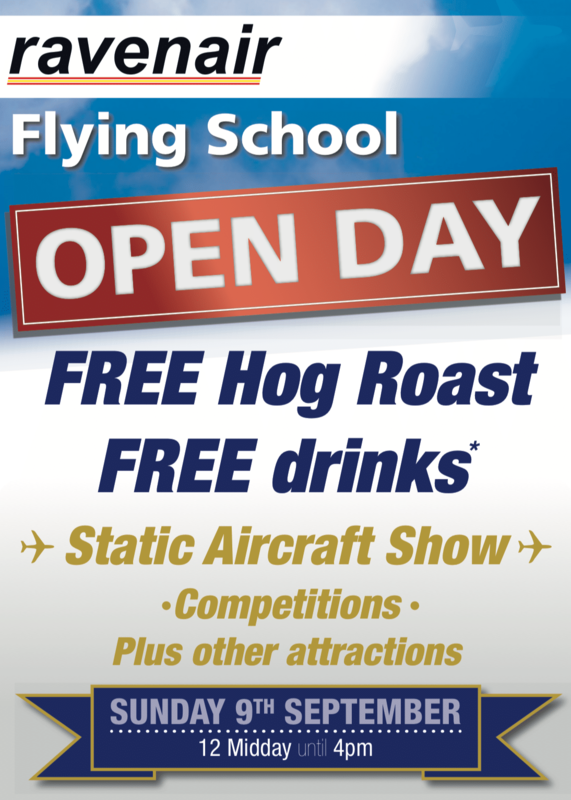 We are opening the doors for our Flying School with an open day from midday to 4pm on Sunday 9th September. The team at Ravenair are looking forward to welcoming you all to our school. 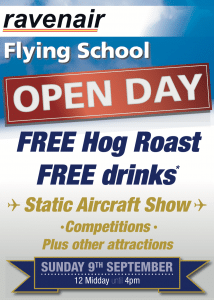 We will have various activities to keep you all entertained, including a raffle, lucky- dip for children, static aircraft display and our future careers table where you can chat with our staff about PPL and advanced flight training. Aerobility and North West Air Ambulance will be joining us on the day. The first period of continuous strike action at Liverpool John Lennon Airport concluded at 07:00hrs this morning; GMB members remain under an overtime ban and the next continuous action is on Monday 03rd September from 07:00hrs to 19:00hrs. There have been no Airport related delays or impacts to on time performance over the first 36 hours of industrial action. Full contingency is once again in place for Monday 03rd September. If anyone has any questions, give me a call. I wanted to provide an additional update to that which I sent you last week (as below) regarding the planned industrial action at Liverpool John Lennon Airport. Today the Airport team met with the GMB & ACAS in an attempt to avert the upcoming industrial action; a final offer was made of 2.2% plus £150 one off payment and whilst the GMB have agreed to send this offer to its members for a postal vote to determine any continued action outside of that already planned, they will not defer the upcoming action planned for this weekend or for that of September 03rd. Therefore, action will commence with an indefinite overtime ban from 23rd August onwards, plus strike action to commence at 19:00hrs on Thursday 23rd August, lasting 36 hours until 07:00hrs on Saturday 25th August with further action on Monday 03rd September from 07:00hrs to 19:00hrs. This action will involve colleagues from the Airport Fire Service, Airfield Operations, Airport Operations Control and Car Parks. As previously advised the Airport has a robust contingency plan in place that meets all the necessary regulatory requirements and is well positioned to continue normal operations throughout any planned or further industrial action. Full Category 7 operations will remain in place throughout with all normal passenger expectations unaffected by the action. If anyone has any questions or concerns, please contact your normal Airport point of contact or feel free to contact me directly using the details listed below. I will update this Group as and when I have further information. Please see information issued by EGGP Airport Authority. In recent months, Management at Liverpool John Lennon Airport have been in talks with Airport Company employees who are members of the GMB Union regarding the 2018/19 pay award. The Airport Company put forward a pay proposal of a 2% pay increase, back dated to 1stApril, plus a £150 one off payment. However, out of 60 GMB Union members who voted, 36 chose to reject the Company’s latest pay offer and have voted for strike action. The GMB have subsequently informed the Airport that their members will commence an indefinite overtime ban from 23rd August onwards, plus strike action to commence at 19:00 on Thursday 23rd August lasting 36 hours until 07:00 on Saturday 25th August with further action commencing at 07:00 on Monday 03rd September for 12 hours until 19:00 that same day. This action will involve employees working at the Airport in the Fire Service, Airfield Operations, Airport Operations Control and Car Parks. The Airport Company is very disappointed with the result of this ballot and firmly believes that its pay proposal compares favourably with pay increases seen by many other private and public sector organisations. All Airport employees receive an excellent package of terms and conditions of employment including health care, sickness benefits and a generous pension scheme. Talks between the Airport and the GMB to resolve this pay dispute will continue, however plans are in place that will ensure there is no impact on the passenger experience and that it remains business as usual during this time. Please be advised that the Airport Authority have published that PPR will not be granted for aircraft using the Main Apron on 26th May 2018 and surrounding days before and after the 26th. The actual start and end time of the restriction has not yet been published by the Airport Authority. Operators can apply for PPR via the FBO and the FBO will facilitate the PPR application. PPR requests will be held in a “Holding Pool”. 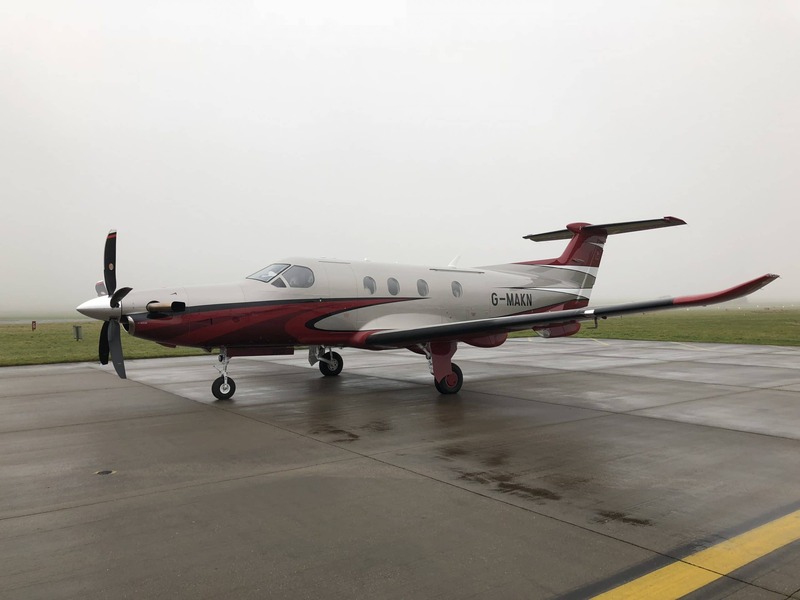 Once the volume of charter flights has been assessed the Airport Authority will then begin to issue PPR for aircraft requiring the Main Apron if sufficient apron stands remain available. It is highly likely that the Temporary Demarcated Area (TDA) on the Main Apron will NOT be available for Non-Qualifying Flights. The Demarcated Area at the General Aviation Apron will be available without restriction and Ravenair / LAS will continue to issue PPR’s as Lead Tenant. Please note that the GA apron can accommodate aircraft (fixed and rotary) up to and including 10,000 Kgs MTOW. We are happy to processes any PPR applications for genuine flights as detailed above. Should any changes occur we will contact operators. We are pleased to welcome the next SET type to our managed operations. PC12/47E G-MAKN MSN1744 arrived new from the factory today. 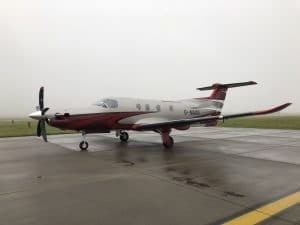 The aircraft will be used for EASA PART NCO Dry Hire/Lease Operations. G-MAKN at a Foggy Humberside Airport 21st December 2017.